Bronze-framed windows pierce the yellow-brick facade of this house on one of the oldest streets in London's borough of Kensington and Chelsea (+ slideshow). 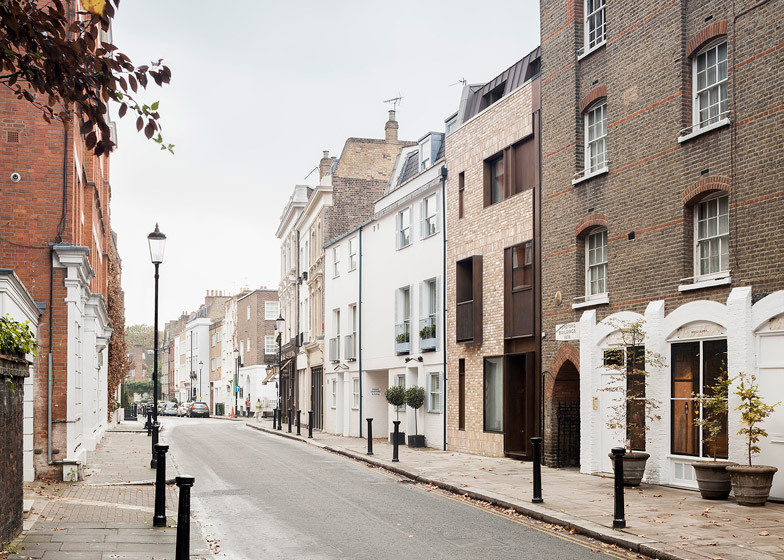 London architecture studio TDO was invited by developer Echlin to create a contemporary home on Old Church Street – a road that is thought to be the oldest in Chelsea, mentioned in records dating back to the medieval period. The street has a diverse architectural heritage, encompassing typical Georgian and Victorian terraces, alongside a house designed by Erich Mendelsohn and Serge Chermayeff for the publisher Denis Cohen and a Walter Gropius-designed home for politician and playwright Benn Levy, both from the 1930s. 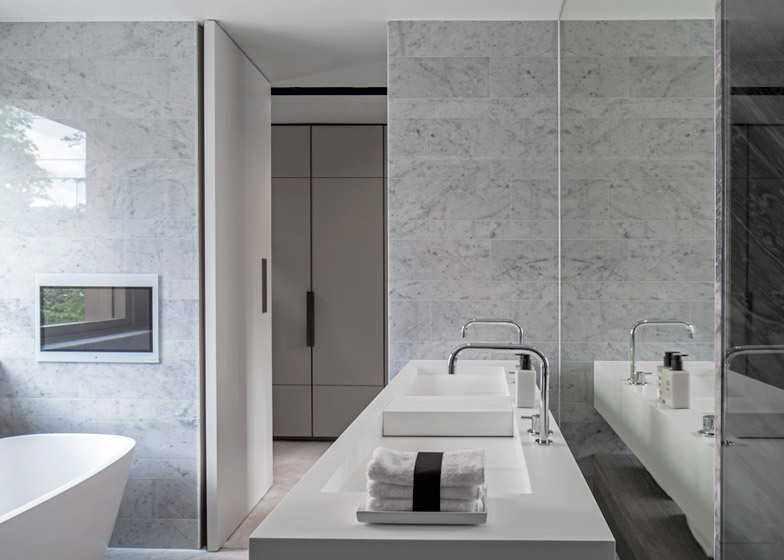 This range of architectural styles, which are all representative of their time, prompted a design that combines modern detailing and material finishes with more traditional proportions. "The design of the formal street elevation is based on a contemporary reinterpretation of the street's fenestration rhythm," TDO co-founder Doug Hodgson told Dezeen. "We generated a grid from the street's varied window levels and proportions. 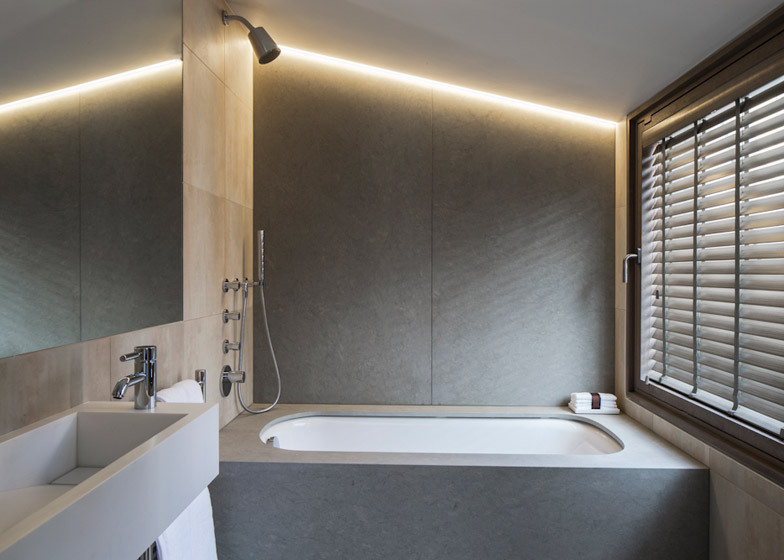 The window openings and glazing depth within this grid reflect the relative necessity for use and privacy internally." Large windows provide views out from the house's living areas on the ground and first floors, while more private spaces such as the master dressing room on the second floor feature smaller apertures. Fixed-pane windows with minimal frames were selected, contributing to the facade's contemporary aesthetic. Adjacent to the windows, solid surfaces made from bronze-patinated gilding metal can be opened or closed, depending on the desired level of ventilation, security and privacy. In places, the windows are set back in their bronze reveals to add a degree of privacy, while the main entrance and a Juliet balcony – a false balcony – off the first floor study extend out towards the street. The bronze details were developed in collaboration with a specialist shopfitter. At the rear of the property, where a more open relationship between inside and outside is possible, most of the apertures in the facade are glazed and a balcony projects from the first floor living room. London stock brick – a traditional type of handmade brick with a distinctive yellow colour – was chosen for both the front and rear facades, offering a further reference to the historic context. "The rough nature of the brick is contrasted by the smooth bronze detailing," added Hodgson. Inside, floors contain either one or two main rooms. The kitchen and dining room sit below ground level, while living rooms occupy the ground and first floors, and bedrooms and bathrooms are located on the two uppermost storeys. 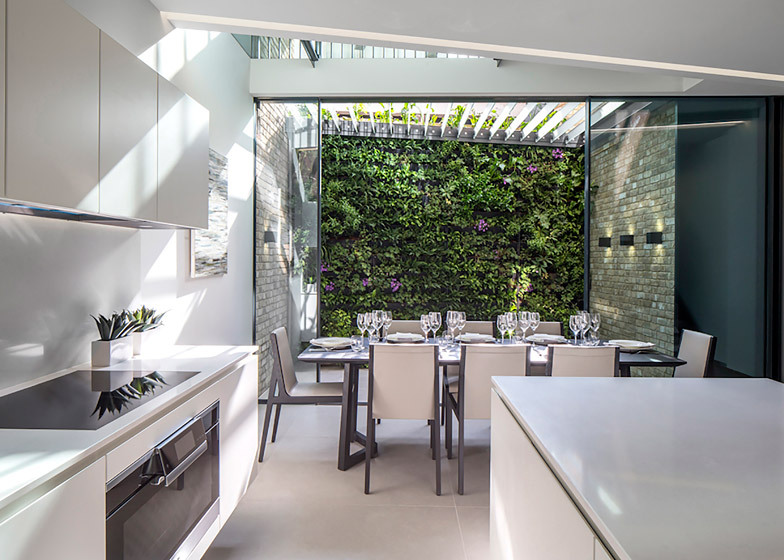 A lightwell set back from the boundary wall enables natural light to reach the kitchen and creates space for a small outdoor terrace. The rear wall of this space is covered in plants, which are irrigated using recycled rainwater. 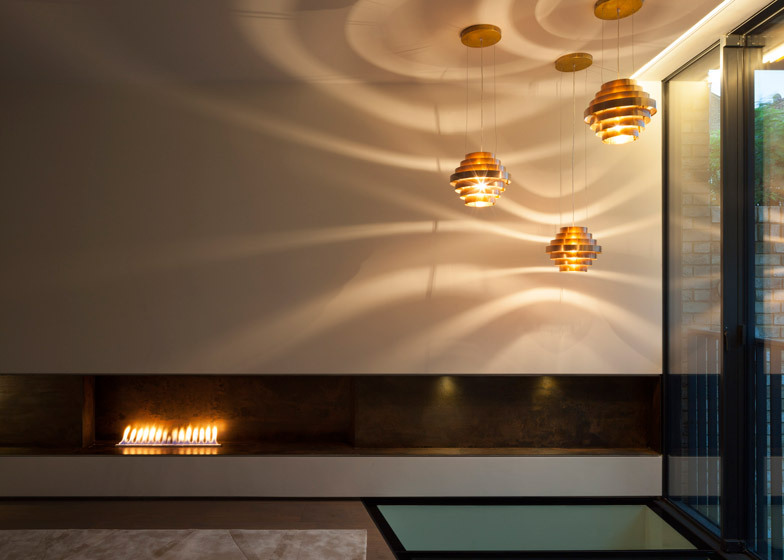 A glass panel set into the floor of the reception area on the ground floor brings in additional light to the kitchen. 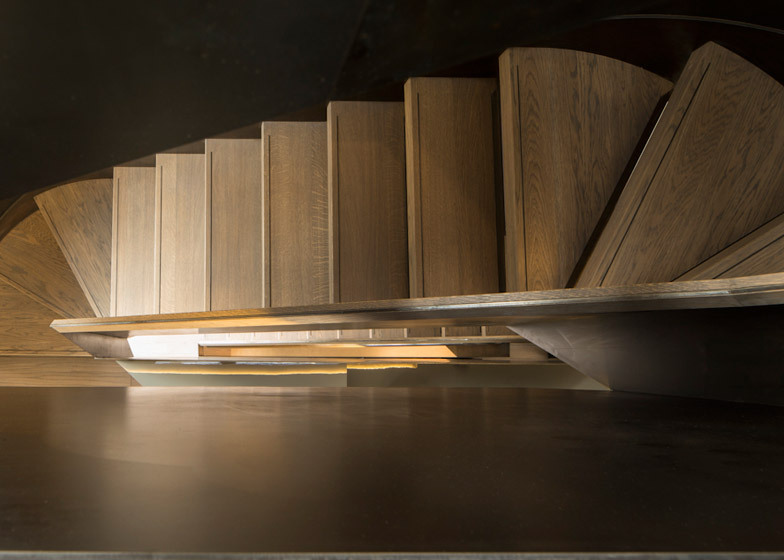 The centrepiece of the interior is a winding smoked oak and patinated steel staircase. Open wooden treads allow natural light to pass through to the levels below. "The stair is pulled away from the surrounding walls and occupies this volume," Hodgson added, "allowing light to fall through and around its form, giving legibility to the building." 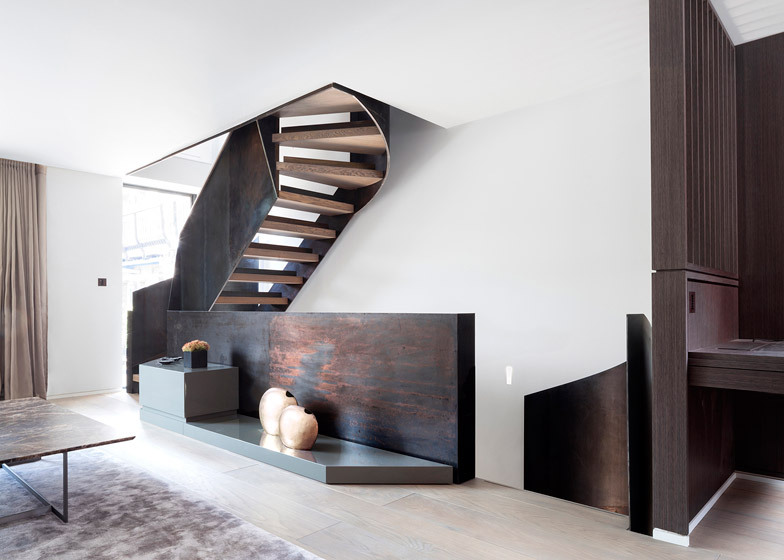 To maximise the usable space on the basement, ground and first floors of the narrow house, the staircase connects directly with the rooms rather than requiring an additional landing. Photography is by Ben Blossom, apart from where otherwise indicated.